Q.1 The shape of the top surface of a table is a trapezium. Find its area if its parallel sides are 1 m and 1.2 m and perpendicular distance between them is 0.8 m.
Hence, the area of the top surface of table is 0.88 m2. Q.2 The area of a trapezium is 34 cm2 and the length of one of the parallel sides is 10 cm and its height is 4 cm. Find the length of the other parallel side. Sol. Let the other parallel side be b. Hence, the length of the other parallel side is 7 cm. Q.3 Length of the fence of a trapezium shaped field ABCD is 120 m. If BC = 48 m, CD = 17 m and AD = 40 m, find the area of this field. Side AB is perpendicular to the parallel sides AD and BC. Hence, the area of the field is 660 m2 . Q.4 The diagonal of a quadrilateral shaped field is 24 m and the perpendiculars dropped on it from the remaining opposite vertices are 8 m and 13 m. Find the area of the field. Hence, the area of the field is 252 m2. Q.5 The diagonals of a rhombus are 7.5 cm and 12 cm. Find its area. Sol. Given, diagonals of rhombus are d1 = 7.5 cm and d2 = 12 cm. Hence, the area of rhombus is 45 cm2. 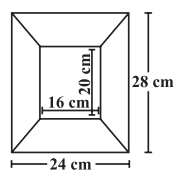 Q.6 Find the area of a rhombus whose side is 6 cm and whose altitude is 4 cm. If one of its diagonals is 8 cm long, find the length of the other diagonal. Sol. Given, base of rhombus = 6 cm, altitude = 4 cm and one diagonal d1 = 8 cm. Hence, the length of the other diagonal is 6 cm. Q.7 The floor of a building consists of 3000 tiles which are rhombus shaped and each of its diagonals are 45 cm and 30 cm in length. Find the total cost of polishing the floor, if the cost per m2 is Rs 4. Sol. Given, diagonals of rhombus are d1 = 45 cm and d2 = 30 cm. Therefore, area of 3000 tiles = (675 x 30000) cm2 = 2025000 cm2 = 202.5 m2. Given, the cost of polishing is Rs 4 per m2. Hence, the total cost of polishing the floor is Rs 810. Q.8 Mohan wants to buy a trapezium shaped field. Its side along the river is parallel to and twice the side along the road. If the area of this field is 10500 m2 and the perpendicular distance between the two parallel sides is 100 m, find the length of the side along the river. Now, let the side along the river be l m and so the other side along the road will be 2l m.
Hence, the length of the field along the river is 140 m.
Q.9 Top surface of a raised platform is in the shape of a regular octagon as shown in the figure. Find the area of the octagonal surface. From figure, area of part A & C will be same which resembles a trapezium. And part B is a rectangle. = 1/2 x (11 + 5) x (4) = 32 m2. = 11 x 5 = 55 m2. = 2 x 32 m2 + 55 m2 = 119 m2. Hence, the area of the octagonal surface is 119 m2. Q.10 There is a pentagonal shaped park as shown in the figure. For finding its area Jyoti and Kavita divided it in two different ways. Here, the pentagonal park is divided into two trapeziums. Here, the pentagonal park is divided into one triangle and one sqaure. Hence, the area of pentagonal shaped park is 337.5 m2. Q.11 Diagram of the adjacent picture frame has outer dimensions =24 cm × 28 cm and inner dimensions 16 cm × 20 cm. Find the area of each section of the frame, if the width of each section is same. Given, width of each section is same. Therefore, area of figure I will be equal figure II and area of figure III will be equal to figure IV.